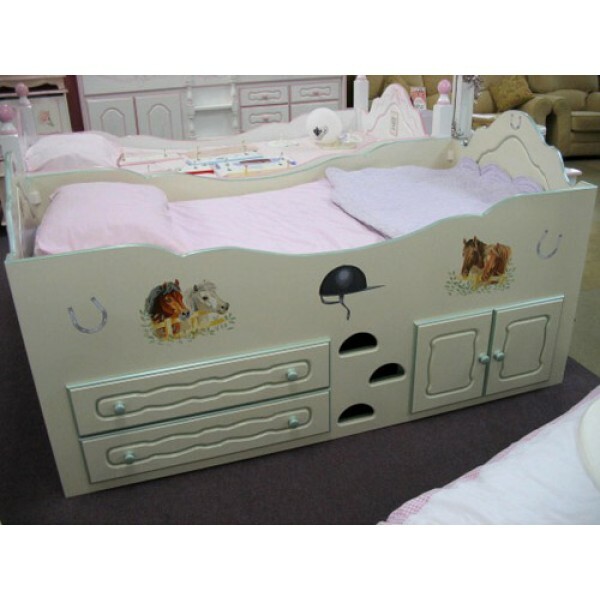 Girl's 3' cabin bed (no posts) with 'Pretty Ponies' hand-painted by Andrew. You can send us a picture of your own pony for us to hand paint on your special bed! Bed shown in off-white with a pearlised green trim colour (optional). Bed also has 'routed' door and drawer fronts. Available in 2' 6", 3'. Mattress should be no thicker than 6" for toddlers and 7" for children 6yrs plus - not included. Measurements 79" long x 40" wide x 41".